The theme of scholars in rustic retreats appears to have been popular with rhinoceros horn carvers. Perhaps because it showed off their talent in the carving of intricate landscapes, while it also would have appealed to the taste of their clients, who could imagine themselves enjoying the tranquility and joys of such natural settings. 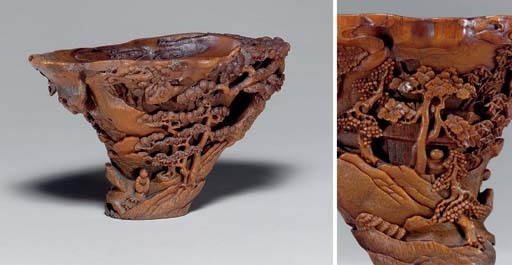 Several cups of this type are illustrated by T. Fok, Connoisseurship of Rhinoceros Horn Carving in China, 1999, nos. 136, 151, 154 and 159. The inclusion of the pair of cranes, one in flight, in the scene, would also have appealed to a scholar or official as it implies the wish, 'May you rise high and become an official of the first rank' (yipin gaosheng), as described by Terese Tse Bartholomew, Hidden Meanings in Chinese Art, Asian Art Museum of San Francisco, 2006, p. 107, no. 5.6.1.